We are happy to announce that Koicha "濃茶" is newly added on our menu. Please kindly note that the amount is limited. If you would like to taste Koicha, please make a reservation. Hope you enjoy deep umami and natural sweetness of Japanese green tea leaves! What is Koicha "濃茶" ? 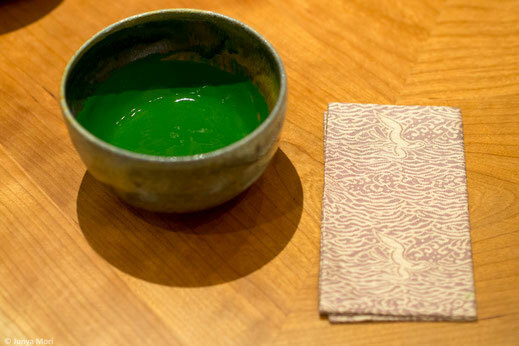 Koicha is literally and actually very thick matcha served in a formal tea ceremony, which is roughly four times as thick as usucha, thin tea. The grade of matcha powder for koicha is higher than the one for thin tea, and they are named thick tea grade and thin tea grade respectively even though they are both ceremonial grade. We have selected very high grade koicha to elevate your experience. In an authentic tea ceremony, koicha is served for three to five people in a single tea bowl. So, we offer the option to have koicha out of a single tea bowl sharing it with your loved ones or to have adequate amount of koicha from smaller tea bowl so that you can drink it up by yourself. All will be served with a single tea bowl. Please choose the adequate course depending on the size of your company.